Currently, influenza typing in clinical practice is performed using an immunochromatography method based on antigen-antibody interaction. This method enables simple diagnosis of infectious diseases. However, it also has a problem in that a single molecular recognition element (MRE) only recognizes a specific single target analyte. Meanwhile, a team of researchers led by Osaka University had previously succeeded in multiplex detections of influenza viruses (influenza types A and B and the subtypes of influenza A) with high accuracy using a novel single virus detection method that combines a nanopore sensor and artificial intelligence (AI) technology. In this study, the team succeeded in applying the concept of immunochromatography to the AI-driven nanopore sensing approach. As published in the Journal of the American Chemical Society, they demonstrated identification of influenza viruses with a high degree of accuracy by virtue of specific intermolecular interactions between a single virus and a peptide molecule in a nanopore by using ionic current signal pattern analysis through machine learning. The researchers synthesized peptide molecules (peptide probes) for a nanopore sensor by using peptide engineering. Unlike conventional methods of immunochromatography, they chose to design peptide (recognition) probes with weak speciﬁcity to hemagglutinin of the influenza A virus. They also developed Au nanopores and decorated the wall surface with the peptide probes. As a result, the team succeeded in prolonging the time for specific viruses to pass through the nanopore (translocation time) depending on virion-peptide intermolecular interactions in single-virus detections by a nanopore sensor. In addition, by applying pattern recognition using machine learning to analysis of ionic current signals, they observed distinct differences in molecular interactions between the peptides and the viral surface of influenza A and B. 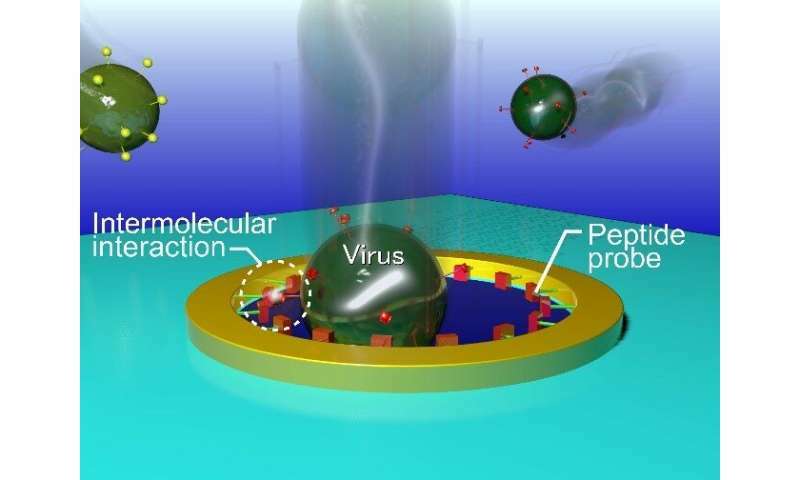 The researchers succeeded in developing a novel virus identification method based on the recognition of a single particle to a few molecules using nanopores, demonstrating the usefulness of this device in influenza typing. Corresponding author Makusu Tsutsui says, "Our nanopore sensor for molecular recognition can be used for various analytes from DNA to bacteria simply by changing the size of the pore, which will lead to single-virus detections that undermine conventional immunochromatographic tests using many samples and recognition molecules."